"The Pet Revolutionary of the Church People of America"
Many of you know that I knew Saul Alinsky and liked him. Yes, Mr. Alinsky knew what he was doing, when he purposely made enemies. For example, in Kansas City, where I met him, police brutality was a huge problem in the "projects." I witnessed it. So, if the Chief of Police is hated by the people Mr. Alinsky was trying to get to stand up for themselves and live with pride and dignity, then Mr. Alinsky would sucker the Chief into saying something bad about Mr. Alinsky, thus enabling Mr. Alinsky to achieve immediate trust from the people who knew that police brutality was very real in their neighborhoods. Alinsky wanted real change. He did not want people to be dependent. He did not want poor people to be discriminated against. He did not want the status quo to be continued. He wanted people to take control of their own lives, their own neighborhoods. It is true that there were many "church people" who helped bring in Mr. Alinsky to organize communities across America. Many of these men and women had one foot in the "projects" and one foot in the circles where powerful people like the chief of police lived. I knew Mr. Alinsky in 1968, about the time that this interview was conducted. It was a time of great change in America. In this tape, though, Mr. Alinsky comes across as a hateful idiot. Is he espousing adultery? Were Mr. Alinsky's organizing programs successful? Well, they mobilized a lot of people to demand better schools, better living conditions, better treatment from the police. They learned how to organize and gain political power. In the final analysis, though, all of us have to be the best each of us can be as individuals. We have to believe in ourselves, make the most of ourselves, work hard, and take advantage of the opportunities that America provides, and the abilities that God has given to each of us. That includes our responsibilites as parents. It includes our responsibilities as "church people," sharing what we know about the love of God. Indiana Governor Mitch Daniels says he plans to sign a bill disallowing Medicaid funds to pay for abortions. In order to resume receiving government funds, all an organization needs to do is to stop using federal funds to pay for abortions, or "separate those operations that perform abortions." On a related note, the authors of the book Freakanomics found that the main reason we saw crime drop so significantly the last ten years was the easy availability of abortions to low income women. "It is best to hate people on an individual basis only." Jill Conner Browne, in her hilarious book entitled The Sweet Potato Queens' Guide to Raising Children for Fun and Profit, advises us to choose tolerance. By that she means "It is best to hate people on an individual basis only." Even though it is "more time-consuming and labor intensive," she advises us to "gather your own information on another person before you choose to hate them." (This applies to loving them, as well). If you go here, I pretty much guarantee you will soon have a smile on your face. How is this for a creative bookshelf? Victor Davis Hansen's latest Pajamas Media column is up, and covers a lot of ground under the title Living the Obama Dream. From Gas Dreams Come True to Big Debt, Small Problem, to The Logic of Illogical Foreign Policy, our overseers need not be bothered by fear of hypocrisy or conflicts of interest. After all, they are just trying to control us "hoi polloi." "In war, the closer you get to blood, the closer you get to truth." 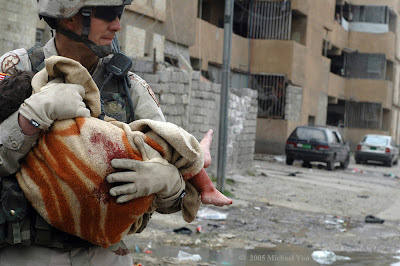 If you have not followed Michael Yon's reporting on the wars in Afghanistan and Iraq, I urge you to do so here. Here is a brief one from Iraq: "In war, the closer you get to blood, the closer you get to truth. One day in Iraq there was a car bomb. It was like any other day at that time. Several American Soldiers were wounded." 20:1 Now on the first day of the week Mary Magdalene came to the tomb early, while it was still dark, and saw that the stone had been taken away from the tomb. Here is something that bothers me when I let myself think about it. Some of the most evil people I have known have been people who proclaim themselves to be worshippers of Jesus Christ. Have you encountered this phenomenon? Some words of wisdom from this blog. One of the most pernicious myths about happiness is that it's selfish to try to be happier. In fact, research -- and experience -- prove just the opposite. Happy people take greater interest in the problems of the people around them, and in social problems. They spend more time helping others, and are more likely to volunteer and to give away money. Happiness gives people the emotional wherewithal to turn outward, while the less happy are more likely to feel distrustful, isolated, and preoccupied with their own needs. So if it’s selfish to be happy, we should aim to be happy, if only for selfless reason. The creed of the left? If it’s good, the government should subsidize it. If it’s bad, the government should ban it. If outcomes are in any way perceived by any group to be sub-optimal, then the government should regulate it. Anyone who opposes these bans, subsidies, and regulations must therefore be a supporter of bad outcomes, hate poor people, want people to get sick and die, etc. Sometimes you just have to laugh about it! Those of you who are parents may not realize it, but there actually is some humor to be found in that life-changing responsibility. Jill Conner Browne proves it in The Sweet Potato Queens' Guide to Raising Children for Fun and Profit. The book is one page after another of wonderful humor and truth. I'll put this book up against any so-called parenting expert's book for insight any day. What? Obama not keeping his word? As a moral matter, the stance of the United States is shameful. To stand by passively while hundreds of people seeking freedom are gunned down by their government makes a mockery of the U.S. commitment to human rights. In recent months President Obama has pledged repeatedly that he would support the aspiration of Arabs for greater freedom. In Syria, he has not kept his word. Please, Fred, consider running again! 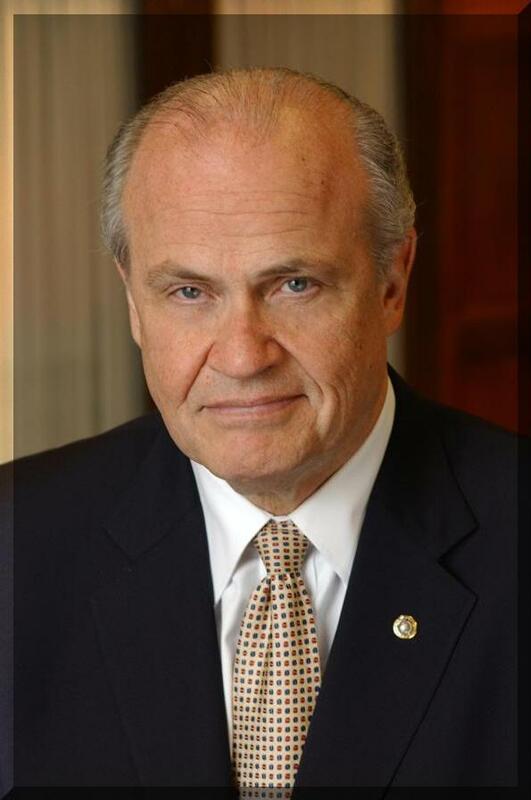 Fred Thompson writes here about the media. I really like this guy, and wish he would run again in 2012. He has ended his radio show. I hope that means he is considering running again for President. From John at Powerline: "We are living in a bizarre moment in history. 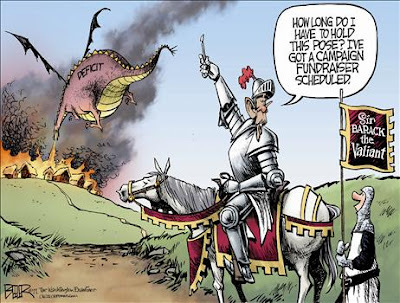 Our establishment--the press, the academy, all unions, most politicians, many in business who have skin in the Ponzi game--assure us that borrowing trillions of dollars to finance wasteful spending, while sticking our children with the tab plus interest, is perfectly sensible. On the other hand, believing that we should live within our means is? Crazy!" What, if any, is the connection? In surfing the blogosphere today I learned two things. I wonder if they are connected. 1.) Obama has approved the use of drones to bomb Libya. Secretary Gates says the bombing has begun. 2.) John McCain is in Libya meeting with the rebels, whom he says are his heroes. In Carl Hiassen's Nature Girl one of the sanest characters is a twelve-year-old boy. I think there is a lot of truth in that. Children become accustomed to and adjust to the craziness of their parents. I see that in each of my kids. Although each of them have their own quirks that might be cause for concern, each of them also has qualities that help lead the family toward a modicum of sanity. 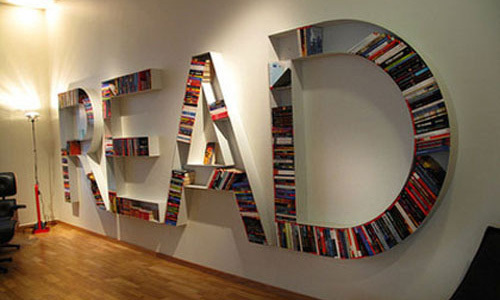 Are you a Christian who is not impressed by most preachers and Christian authors? Try Gagdad Bob at One Cosmos. Here is a line from his April 13 post: "The One is simultaneously closer to us than our own being, and yet beyond our imagining." Here is a line from his April 11 post: "Pride -- or hubris -- is the sin from which all others flow, as it essentially involves an overvaluation of the self (or ego) accompanied by a devaluation of the other." Another: "Such rulers bring only change we can bereave in." (Bob likes to play on words). Another reason to go to One Cosmos is the comments section. On the subject of abortion, one of Bob's readers had this to say: "Odd how the same people who claim that sexual orientation is genetically fixed at conception claim that the fetus is not a person. Which means that for the prescientific leftist, it is possible to be a nonexistent homosexual, or a specified nothing." (When leftists dare try to attack the Raccoons' postulates, they get swamped by comments like "This man is way under our heads.") That same commenter, Julie, linked to this wonderful blog post. Sara loves this song. She is going to sing this at an awards night on May 10 at her school. She knows all the words and melodies, and accompanying hand and arm movements. Is silence really the best option? With Passover and Easter upon us, go here to read a passionate post by James Lewis on the alliance between the totalitarian left and totalitarian Islam. Why are Christians and Jews silent? Are they cowed by the media? Except for a few, like Winston Churchill, they were silent in 1939, too. Remember how they used to ridicule Reagan on his proposal for a missile defense system? Here is a beginning account of the April 14 Aegis Missile Defense success. "This evening on the other side of the world, from an atoll 2,300 miles away, an intermediate range ballistic missile (IRBM) was launched towards Hawaii. As the threat missile arched over the vast Pacific, a forward-based US Army radar on Wake Island bristled, locked on to the target, and immediately handed off the missile's trajectory to the missile defense command & control system. Meanwhile, two state-of-the-art satellites gazed down from above, tracking every flicker of the hostile missile. Hundreds of miles away in the waters west of Hawaii, the USS O'Kane was alerted. Using the early trajectory data supplied by the US Army soldiers on Wake Island, O'Kane sprang into action. Launching their interceptor much, much earlier than possible had they relied solely on their own shipboard radar, the US Navy sailors anxiously waited." This table is furnished by the I.R.S. 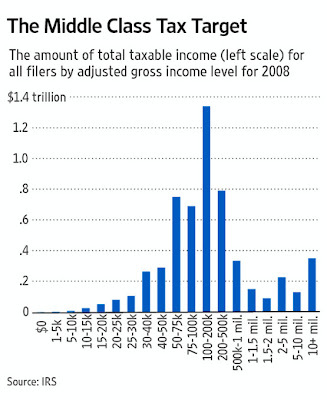 The bulk of the money comes from, you guessed it, the middle class. An electrician in England faces a disciplinary hearing from the housing association where he works for displaying an eight-inch cross made of woven palm leaves on his dashboard. The Chinese want our nuts! I could not help myself. Please forgive the headline for this post. It just seems appropriate in so many ways. First they wanted our walnuts. Now it's our pecans. The Wall Street Journal tells you everything you want to know here. But it's not just pecans. Between 2005 and 2010 exports to China of U.S. soybeans, dairy, rice, and fruit juice products more than tripled. 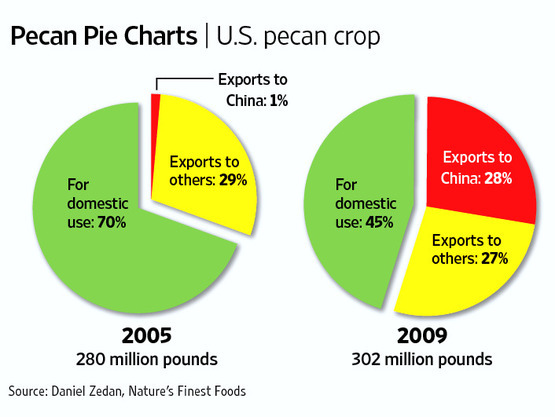 Exports of pecans rose more than 20-fold in the same period, according to the Journal article. If we are saved by God's grace, how can we go around acting like we are superior? All-knowing self righteousness and Christianity are surely incompatible, are they not? Unions cutting the throats of union workers? Unions in Washington D.C., losing a fight to keep Wal-Mart out, may be cutting the throats of union workers in stores trying to compete with Wal-Mart. Via Instapundit, this story about a Chevy Volt causing not one, but two fires in the same garage in Connecticut. If you were "shopping for a deity," what qualities would you look for? Mushroom has some ideas here to kick off the conversation. While talking with the local librarian yesterday I was delighted to learn that Ridley Pearson and Dave Berry have written two more books in the "Peter" series. I read Peter and the Starcatchers and Peter and the Shadow Thieves to Jon and Greg, and we thoroughly enjoyed them both. I placed a hold on number three, and eagerly await it. What fabulous imaginations and senses of humor these two men possess! Both books build to thrilling endings. Carl Hiassen is an author who seems to think we humans are devolving, not evolving. In Nature Girl Hiassen writes about a Seminole Indian, a housewife. her son, her ex-husband, two telemarketers, the male telemarketer's wife and mother, a college coed, a businessman, and, well, you get it: we've all devolved in varying degrees, yet still have some endearing qualities (except for the male telemarketer). While I don't share Hiassen's premise about our devolution, there is enough truth in it that, when you add Hiassen's gift of humor, it makes for a good read. Have Christians completely given in to paganism? Easter is now celebrated with nonrecyclable plastic eggs! No painting real eggs; they cost too much, and that is just way too much right brain activity! What is our problem? Are we saying to God that we just don't believe Jesus was any more than just a great man? The resurrection of Christ Jesus is the greatest and most important event of history. Yet, we teach our children that Easter is all about eating Peeps and hiding plastic eggs! Oh, and they are not to be referred to as Easter Eggs. The politically correct term in the Seattle School District is "Spring Spheres." Tonight's prayer time tucking Sara in bed was just so sweet I wish I had taperecorded it. It went something like this. "Dad, I am so glad God chose you to be my father." "I am, too, Sara. I didn't know you were going to turn out to be such a sweet girl." "Oh, it wasn't me. I prayed to God. He listens, then tucks the prayer away and makes it happen. I asked Him to help me be a sweet girl." At the very least, I need always to carry a pen and some paper, so I can quickly write down these sweet moments verbatim. California hanging in the balance? Victor Davis Hanson writes in Pajamas Media about the changes he has seen in his state. What changes have you seen in yours? I had never heard of Ann Barnhardt, but at the end she gives her address, and she lives less than one hour from where I live! Wow! Take a few days off from surfing the blogosphere, and this is what you miss! Freedom is a good thing! Who is responsible for your behavior? You, and you alone! You always have the ability to choose. God gave us the example of Jesus. We can choose compassion, kindness, and empathy, even if we don't feel it in out hearts. We can choose forgiveness, even if we don't feel it in our hearts. By making those choices, we free ourselves from dependence on those who have wronged us. Freedom is a good thing. The narrator of the novel Cage of Stars is a twelve-year-old girl! She had been babysitting her two younger sisters, and they were playing hide and go seek on their rural property near Cedar City, Utah. The narrator was hiding. Her sisters were looking for her. They never found her, because a schizophrenic local pharmacist (!) savagely murdered them in a shed on the property. The pharmacist had no history of violence, not even a parking ticket. Can you imagine what this act did to this family? To this 12-year-old? The book is superbly written, and yes, Terri, it does portray Mormons in a very good light. Jon, Greg, and Sara just returned from five days with their mother in New Mexico. Both Jon and Greg, when I asked them separately to tell me something about the trip, said, "We played with fire!" Apparently the teenager who works on the ranch of their mother's boyfriend showed them a trick in which you pour lighter fluid on your hands, then light a match to the fumes, and wave the fire around. I was completely dumbfounded. I will be taking these boys on a surprise trip to the local fire station for some fire education. Well, at least they told me about it. Sigh. One of the mysteries of life is that women often seem to be attracted to jerks. Is it because these women were abused by their fathers or step-fathers when they were little girls? Are there other reasons? Do they reason that because their man is so obviously mean to other people, especially people that don't have anything he wants, that somehow that means he will be ferocious in protecting them? Have they subconsciously bought into the script their childhood tormenter developed for them, so that they believe themseves not worthy of love and admiration from a "nice" guy? Now, perhaps because I have been subliminally influenced by my most faithful reader and commenter on this blog, Terri Wagner, I have been drawn to begin reading a novel called Cage of Stars in which the narrator is a Mormon from Utah. The author is Jacquelyn Mitchard. Laura Hillenbrand has written a marvelous book entitled Unbroken. The main character is Louis Zamperini, a 1936 Olympian from Torrence, California. World War II ruined his hopes for Gold in the 1940 Olympics, which were cancelled because of the world war. Louis becomes a bombadier, his plane gets shot down over the Pacific, he and another man survive for forty-some days in a six-foot raft, they get captured by the Japanese, he endures horrendous abuse in Japanese POW camps, comes home after the war, gets married, becomes an alcoholic, attends a Billy Graham crusade in L.A., remembers the vow he made to God when praying for survival aboard his raft, and lives the last years of his life serving Christ by operating a camp for wayward boys. Laura pulls no punches. Her research is more than impressive. Here's a question for you: How many movies have you seen portraying Nazis? How many have you seen portraying sadistic Japanese soldiers of Emperor Hirohito? I know the answer: you have heard far more about the Nazis, right? Our hearts all go out to the Japanese people for what they have recently experienced with earthquakes, tsunamis, and nuclear reactor melt downs. However, our fear of being racist may get in the way of recognizing truth. The truth is that POWs held by the Japanese fared far worse than those held by the Nazis; in fact, most were murdered. And more were about to be murdered at the time we bombed Hiroshima and Nagasaki. The paradox of vengefulness is that it makes people dependent on those who have harmed them, believing that their release from pain will come only when they make their tormentor suffer. Resentment is the emotion that nails us to the cross of our ruined past. Dorothy Rabinowitz is one of my favorite columnists. She wrote this one yesterday criticizing General Petraeus for his pronouncement "rich in evasions of brutal reality." Petraeus held a press conference condemning the Florida pastor who had presided over a mock trial and burning of the Quran on March 20. Petraeus said the pastor had endangered American troops. But Rabinowitz notes that the words Petraeus chose to use may have done exactly the same thing: endangering American troops by his choice of words. For example, he expressed condolences to those who had been hurt in "demonstrations." The "demonstrations" were actually three days of savage murder in the name of religious devotion, in which 22 innocent people were killed. They are not understandable, these passions that so invariably find voice in mass murder, the butchery of imagined enemies like the people hunted down in the U.N. office Friday, and of everyone else the mobs encountered who might fit the bill. We will not prevail over terrorism and the related bloodlust of this fundamentalist fanaticism as long as our leading representatives, the military included, are inclined to pronounce its motivations as "understandable." By making no mention of the perpetrators of the current massacres—while managing to suggest they were understandably driven to their action—Gen. Petraeus doubtless believed he was taking the appropriate politic path. It's a path that's unquestionably familiar—called appeasement—and one whose usual outcome is also familiar. That none of these emotional proclamations included any judgment, moral or otherwise, about the criminality of the zealots who had just taken so many lives, speaks volumes to those at war with us—all of it encouraging to them. Something to consider adding to the list of things that might endanger the lives of American troops. Mexicans deal with illegal immigrants differently than we do. We give them jobs, food stamps, free education and free medical care at hospital emergency rooms. There is a place in northern Mexico, sharing 230 miles of border with Texas, in which mass graves holding the dead bodies of "at least 60 people" were found this week, according to this article in the Wall Street Journal. 72 immigrants were found dead in the very same town last August. Those immigrants were from Honduras, El Salvador, Ecuador and Brazil. I couldn't resist stealing this one this one from Theo. 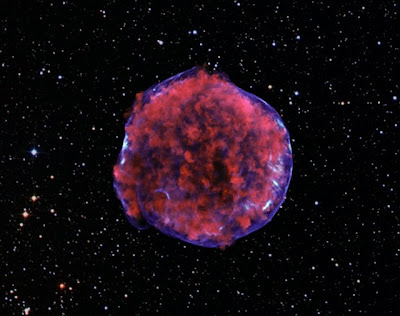 Meanwhile, somewhere in the Cosmos, a star is exploding. Although we have a nice t.v. set given to us by a neighbor who moved away, we do not have it hooked up to receive any television programming. We use it only to watch DVDs. Therefore, when a local sports team becomes worth watching, it means a trip to a restaurant that has t.v. sets. That is what happened last night. I wanted to see the Denver Nuggets, who, since trading away their two best players to New York in February, have become a team of unselfish players who play the game the way it is supposed to be played: hustling on defense, grabbing rebounds, and sharing the ball unselfishly on offense. Stepson Erik, who will be 19 later this month, proudly drove us the thirty miles to the restaurant in his 1992 Honda. Erik works on the car all the time, and has it in pretty good working order. He is attending a Technical College, where he is learning the diesel mechanic trade. As a field placement, he also works with a "mobile mechanic" who comes to people's houses to work on vehicles. Erik is very smart, and learns rapidly. Jon and Greg both love basketball. They were "Ohing and awing" at the skills on display by the players in the NBA game we watched, as we chowed down on fabulous burgers, fries, salads, and delicious rolls with cinnamon honey butter (we brought some rolls home for Sara and Kim to eat for breakfast this morning). In order to get the boys in bed sort of on time, we only watched the first half and a little bit of the second half. But it was a fun boys night out for all four of us. Sara is the early bird of the house, so she has an early bed time, but one of these days she will get to come on these trips to watch sports events, too. Kim was not interested. Unbroken is a wonderful book by Laura Hillenbrand. Its main character, Louis Zamperini, is an Olympian from Torrence, California, with a good chance to win Gold in the 1940 Olympics, after running the 5000 meters in the 1936 Olympics. Because of World War II, the 1940 Olympics get cancelled. Louis becomes a bombadier, gets shot down, and floats with another survivor in a six foot raft for forty-some days in the Pacific, until they land on an island run by the Japanese. He gets transferred to a POW camp near Tokyo, all the while keeping a diary. Louis becomes daily victimized by a thoroughly sadistic Japanese corporal. Have you ever been bullied? I know what Mr. Zamperini experienced was far worse than anything you or I ever have had to endure, but bullying is never a pleasant experience. It is happening to me now in my life. I am choosing to endure it, praying daily for the ability to be kind and empathic, but inside feeling anger and defiance. The POWs in the camp became experts in the art of defiance, thereby keeping their sanity and their dignity. The Camp of the Saints refers us to read this book review in the Wall Street Journal about Gandhi. According to reviewer Andrew Roberts, the book on Gandhi, "Great Soul," by author Joseph Lelyvold "gives readers more than enough information to discern that he was a sexual weirdo, a political incompetent and a fanatical faddist—one who was often downright cruel to those around him. Gandhi was therefore the archetypal 20th-century progressive ­intellectual, professing his love for ­mankind as a concept while actually ­despising people as individuals." How can George Soros be stopped? A very important event is taking place beginning April 8 in New Hampshire. George Soros is organizing a conference of banking experts to remake the global economic system. Do we want America's economy to be controlled by anyone but Americans? Mary Anastasia O'Grady writes in today's Wall Street Journal about Jimmy Carter. Carter has been visiting his "personal friend" Fidel Castro. Not only that, but Carter is willingly being used by his personal friend to demand that the U.S. release five Cuban spies convicted in the United States criminal justice courts. Read the whole thing here. I am reading Unbroken by Laura Hillenbrand. She is the author of the book about Secretariat. This one follows the life of Louis Zamperini, an Olympic runner from Torrence, California, who became a bombadier with the Army Air Corps during World War II. Today's Islamist terrorists have nothing at all on the Japanese in the 1930s and 1940s in terms of vicious barbarism. Here is my question: How could we not have seen what was coming from Japan? From Hitler? Will someone some day ask the same question about Iran? With sadness I took back to the library today the two books I have been blogging about out so much, George W. Bush's Decision Points, and Jill Bolte Taylor's My Stroke of Insight. The latter is the book that has had such a profound influence on me. When Dr. Taylor had a stroke that caused her to lose the functioning of her "doing" left side of her brain, it opened up a new world to her, the here and now "being" right brain. I realized that to be completely right-brain dominant is completely foreign to me. She felt attached to "an eternal flow," "frolicked in glee in a boundless sea," "an unforgettable sense of peace," "connected to the life force of the universe," "divine bliss." I have certainly never felt anything like that. She came out of that experience believing that we were all created to know great joy. I love it when I experience joy. In the last year I have been battling depression. To realize that I can make the choice to let my right brain be more dominant at certain times, is very exciting to me; that I can let go of sadness, anger, and other negative emotions, and replace them with positive emotions. I can get the amount of sleep that my body and brain cells need to do their job of keeping me healthy. I can surround myself with people who need me and love me and believe in me. One of the keys to Dr. Taylor's recovery of her left brain functioning was to have people around her who celebrate her triumphs, not focus on her disabilities. People who accepted her as she was now, and encouraged her to work toward her dreams of who she could become. She learned to become very careful of her "self-talk," to avoid self-pity (that was something George W. Bush also mentioned in his book), to avoid self deprecation, pay attention to the physiological components of feelings and stimuli. She wanted people to come close, to touch appropriately. I hope I don't forget the ideas she shared in her book. Probably the most important one was that we have the power to choose how we respond to stimuli. We can respond with compassion and empathy, even if the person we are dealing with is not coming from a place of kindness. This might help understand why states can't pay their bills! "If you want to understand better why so many states—from New York to Wisconsin to California—are teetering on the brink of bankruptcy, consider this depressing statistic: Today in America there are nearly twice as many people working for the government (22.5 million) than in all of manufacturing (11.5 million). This is an almost exact reversal of the situation in 1960, when there were 15 million workers in manufacturing and 8.7 million collecting a paycheck from the government. 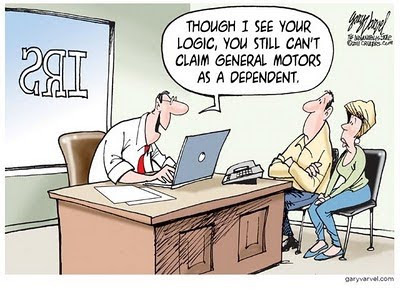 Even Michigan, at one time the auto capital of the world, and Pennsylvania, once the steel capital, have more government bureaucrats than people making things. The leaders in government hiring are Wyoming and New Mexico, which have hired more than six government workers for every manufacturing worker." What country in the Middle East is not experiencing the revolution so apparent in others? Iraq! 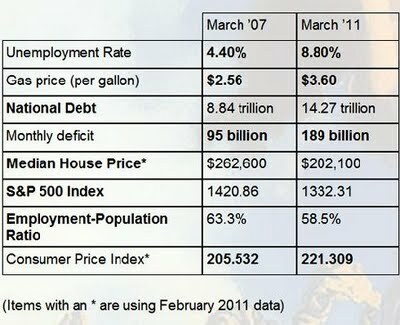 What credit should be given to George W. Bush for staying the course; in fact, "surging" with more troops, in order to help the people of Iraq gain more security? What credit should he get for ignoring the advice of Joe Biden ("break up the country into three religious enclaves"), or Harry Reid ("The war is lost!"). How much credit should George W. Bush get for insisting that all ethnic and religious groups be involved in the process, which also meant going after all terrorists, regardless of their ethnicity or religous persuasions? The people of Iraq have seen Change, and they have Hope. Give the credit to a President who made courageous decisions, with only one focus: to protect America.